Mt. 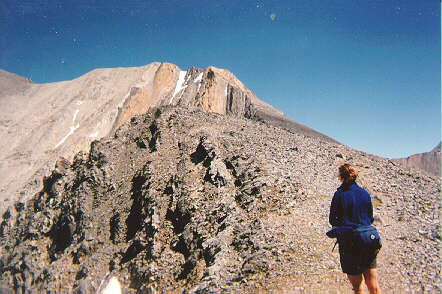 Borah is the highest peak in Idaho at 12,662'. 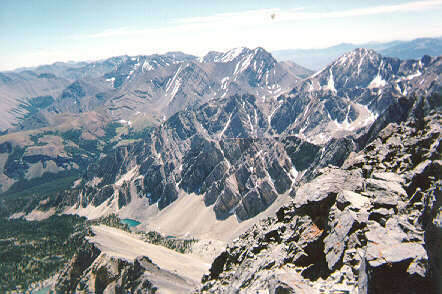 It is in the Lost River Range in south-eastern Idaho and this range contains 8 of the 9 12,000' peaks in Idaho. 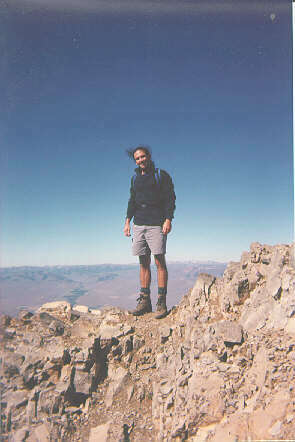 I climbed it in early August of 1997. 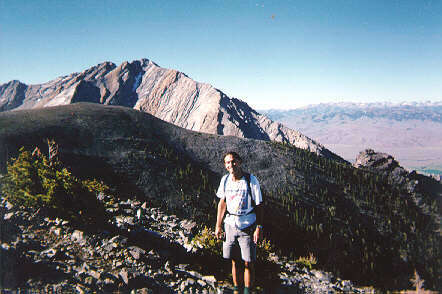 The trail starts at about 7400' above sea level and climbs to 12,662'. There is no water so you have to carry all you'll need for the day. The Forest Service has a good resource page for info on Mt. Borah. Looking west. 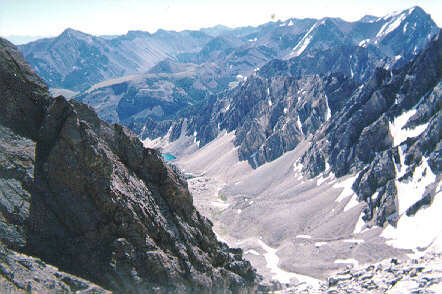 The Sawtooths are in the distance. Looking up at "Chicken-Out Ridge". 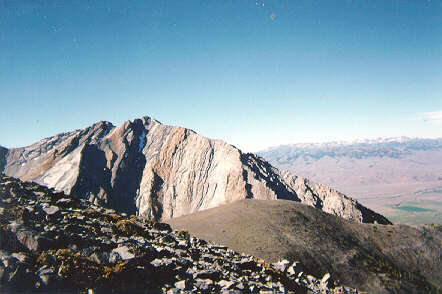 The hike follows this ridge up and to the left. The summit is to the left of the picture. 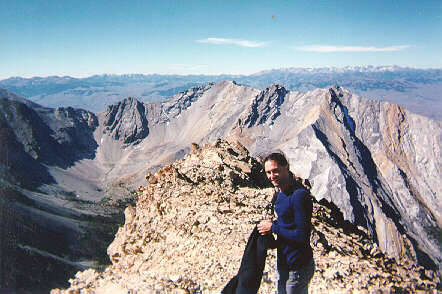 The saddle in the upper-left was where I was stopped in a previous attempt in 1993 by a lightning storm. We had to hole up in the saddle and during a break in the storm we tried to get down but were caught on this ridge when another wave of lightning passed through. 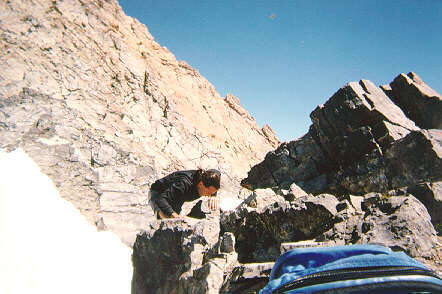 The rocks were crackling and I could feel little sparks of electricity between my wool hat and my hair. The weather was great for this trip though. Note the snow bridge in the upper center of the picture and how steep it is. We have to cross that to get to the summit. This is taken from the saddle in the previous picture looking over into the next valley. 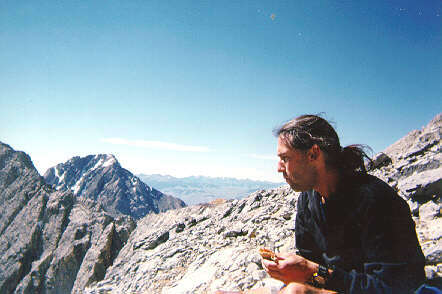 Some lunch at the saddle before the summit assault. At the summit!!! It took 3 hours and 45 minutes to get to the top. Coming back over the snow bridge. 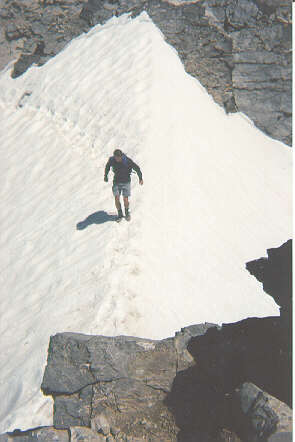 Crossing the snow bridge. It doesn't look steep here but if you fell a self-arrest would be extremely difficult.